It’s a number that puts a frown on the faces of dentists across the country, but nearly 55 million Americans suffer from some form of gum disease, according to a study conducted by the American Academy of Periodontology. That means roughly half of all adults over the age of 30 are at serious risk of developing oral health problems later in life, including periodontal disease and tooth loss. Not only does gum disease negatively impact an individual’s long-term oral health, a number of recent studies have also linked the disease to an increased risk of such chronic diseases as heart disease, diabetes, obesity and cancer. Failure to properly care for their oral health has placed the lives of much of the country’s population in real danger, according to the AAP. In an effort to increase public awareness about the health effect gum disease has on both the mouth and body, the AAP launched the Love the Gums You’re With campaign with a goal of educating about the importance of early diagnosis and prevention of gingivitis and periodontitis (the early and late stages of gum disease). Periodontal disease occurs when plaque, a sticky biofilm comprised of bacteria and food particles, builds up below the gum line. Plaque can contain over 500 bacterial species, and brushing alone does not adequately remove the bacteria from below the gum line. During the early stages of periodontal disease, a condition referred to as gingivitis, patients very rarely experience any kind of pain or discomfort. However, despite any clear warning signs, periodontal disease can cause severe damage below the surface. The disease causes inflammation to occur in the gums, which then results in the gums pulling away from the base of a patient’s teeth. This creates “pockets” that allow even more bacteria to accumulate below the gum line, and exposes the delicate roots of a tooth to plaque. Once firmly rooted below the gum line, periodontal disease begins to attack the bone and connective tissue that holds teeth into position. By eroding the base of teeth, the disease causes teeth to move, shift and eventually fall out. When treated early, the damage caused by gum disease can be reversed. However, by the time the disease progresses into periodontitis, very little can be done to save the damaged gum tissue and affected teeth. Because late stage gum disease offers such a bleak outlook for patients, the AAP’s campaign of Love the Gums You’re With hopes to stress the need for patients to receive regular dental cleanings and checkups. What’s most frustrating to oral health professionals is how easy it is to prevent gum disease, making the effects the disease has on patients’ oral health largely avoidable. The best way to fight gum disease is to practice quality oral hygiene at home. The American Dental Association recommends that patients brush twice a day, ideally once in the morning and in the evening prior to bed, for two minutes at a time. The ADA also recommends flossing at least once a day, preferably at night before brushing. 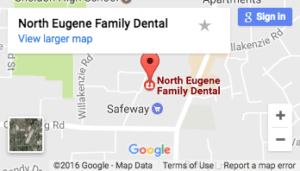 Patients also need to schedule regular dental appointments with your family dentist in Eugene, Dr. Kirchmeier, to maintain their oral health. Check ups and cleanings remain vital to preventing gum disease because they allow Dr. Kirchmeier to examine a patient’s oral health for any early signs of gum disease before it has a chance to progress, and for his staff of dental hygienists to remove plaque from below the gum line. By following just these simple steps, most people can dramatically reduce their risk of gum disease. If the Love the Gums You’re With campaign has its desired effect, the country as a whole will smile a little easier.